The Antipodes project is an innovative one; well conceived and excellent in its realisation. It is a young group but you wouldn’t think so to listen to them. Musical maturity is generally equated with time served on the bandstand, but if the right musicians come together, surprising synergies can occur; artists collectively punching above their weight. Antipodes hits the mark on a number of levels. Firstly the writing is superb. The musicianship is also great but for me it is the communication of a shared vision that lifts them above the ordinary. Given that three members of the band are new to project, that is surprising. At the epicentre of this group are the core members: Jake Baxendale, Luke Sweeting and Callum Allardice. The original lineup featured respected Australian trumpeter Ken Allars. Allars is at present on tour somewhere in a distant corner of the globe – replacing him is Simon Ferenci. It might be supposed that the absence of Allars changed the dynamic, but Ferenci fitted in as if he’d always been there – a trumpet player I had not heard before, but one I will be happy to hear anytime in future. Also new are the bass player Max Alduca and drummer Harry Day. Like Fereci both terrific players and in synch with the over-arching vibe. Without the cushioning bass work and often edgy drum fills the band would be less interesting. Their contributions were on the mark. I have long admired Baxendale’s alto playing, featuring as altoist in some of the best New Zealand line-ups (The Jac, Richter City Rebels, Wellington Mingus Ensemble, JB3 etc). Baxendale pulled off some blinding solos in this gig and I have posted a clip which demonstrates his mastery and inherent lyricism. He is a player with depth. I am also glad that Luke Sweeting was touring with the Antipodes again. Sweeting is the sort of pianist who captivates in numerous ways and his solo bravura on a good number can leave audiences open-mouthed. Perhaps more than anyone else in the ensemble he brings out that trademark Aussie-European aesthetic. The first time I heard Antipodes I identified Ken Allars as being the link to a particular Scandinavian sound; his command of extended technique, but moreover his low volume ambient groove-tone. Now I am revising that view as Sweeting has exactly encapsulated that sound, while doing it in a uniquely Australian way. The other central figure is guitarist Allardice. Often sitting quietly in the mix as his warm comping lifts the others without ever crowding them out. Then out of nowhere, unexpectedly, those heart stopping solos, souring and as fluid as silk in the breeze. Allardice is a fine composer, as are Sweeting and Baxendale. There are shades of meaning to the word ‘Antipodes’. It comes from the Greek ‘to set ones foot upon an opposite place’. If you live in London then the Antipodes Islands of New Zealand are the opposite land mass. For Southern Europe and North Africa it is in Australia. The reverse also applies. Given the musical linkages and especially given the geographical linkages the band is perfectly named (conceived by Australasians living in Germany). This project revives on a regular basis and on current form it stands every chance of becoming an institution. I certainly hope so. Antipodes: Jake Baxendale (alto), Luke Sweeting (piano), Callum Allardice (guitar), Simon Ferenci (trumpet), Max Alduca (bass), Harry Day (drums). I first heard the JAC two years ago and I liked what I heard immediately. Their sound has textural complexity, but the charts are so well written that the band manifests as if it is a single organic entity. As they move through the pieces, rich horn laden voicings appear, shimmer and fade seamlessly into the next phrase. In spite of the heavy punch of the front line, the band can float airily over passages. This affords them choices that are seldom realised by larger ensembles. They have a real nimbleness and this is surprising considering their large musical footprint. A bigger footprint than the size of the band would suggest. The really good nonets and octets achieve this. The solid four-part horn line is the power house of the unit, while guitar and piano balance out the sound. I have to mention Cameron Allardice at this point as he is so integral to the JAC’s sound mix. I have heard them play with and without Allardice and with him is my strong preference. He has grown so much as a performer and soloist over the last year that I hardly know where to start. He is not a loud player but his authoritative solo’s and fills just sing. He gives a soft but penetrating edge to the mix. I watched him at the Tauranga Jazz festival and he approached his solos like Rosenwinkel. Not so much in phrasing but in energy as he gained momentum during solos; lifting free of the earth as the sound flowed among us, like water over a spillway. And all the while maintaining an absolute clarity of purpose. These high wire acts require courage and confidence and he showed these attributes in spades. He is also one of the main composers of the group and his charts are stunning. This is an ensemble of stars and leader, altoist Jake Baxendale is certainly one them. He can deliver searing heart stopping solos and then drop into the mix in an eye blink. He is the other contributor of compositions (and arrangements) and his principle guidance that moulds the unit. His ‘Thieves in the Night’ is a masterpiece of composition. Their album ‘Nerve’, recorded early in The JAC’s life has wide appeal. Since its release they have been on the road (or gigging) almost constantly. The time on the road has sharpened them considerably and that must show in the new album; The recording session takes place in a few weeks and judging by the material that we heard at the CJC gig (and at The Tauranga Jazz Festival), an already polished band will jump up another notch. Every player is integral to this project but trumpeter Lex French certainly stands out. He arrived back in New Zealand from Montreal a seasoned performer; his credentials are impeccable. He is a strong ensemble player and during solo’s he pulls off feats of brass bravura that New Zealand audiences seldom hear. He has chops and ideas and the confidence to pull them off. I have at times worried about the meagre numbers of high-quality trumpet players on the local scene. French may well address this as he will certainly inspire others. Daniel Millward on piano (and keys at Tauranga) gave impressive performances as did Chris Buckland (tenor) and Mathew Alison (trombone). Millward is a fine pianist but for some reason, probably the sound mix, he shone through more on keys at Tauranga. Buckland gave some stunning solos and again the Tauranga performances come to mind. Last but not least are bassist Nick Tipping and drummer Shaun Anderson. Behind every solid group are musicians like these. Tipping is the most experienced of the JAC musicians and he instinctively understands how to keep the groove. Linking rich and complex harmonies like these to the rhythmic flow requires just such a musician. Anderson likewise performs strongly. Working with Tipping and bringing that big band drum feel to the unit. If you love to hear well written charts played to perfection, referencing everything from fifties jazz up to modern times, purchase the JAC’s albums. Once again we must acknowledge Rattle here. Without a quality local label like this, such albums would have less chance of being released. The JAC were deservedly nominated as finalists for the Jazz Tui 2015. Expect to see them nominated next year. 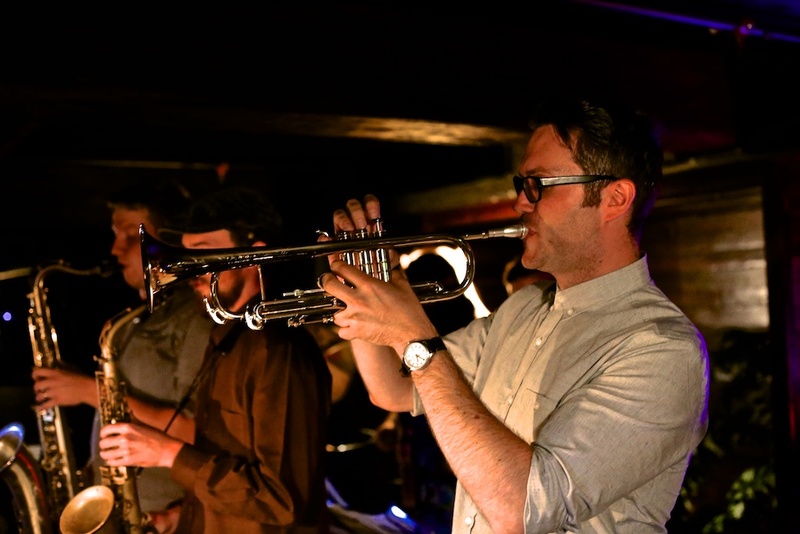 Who: The JAC – Jake Baxendale (alto, compositions, flute), Lex French (trumpet), Chris Buckland (tenor), Mathew Allison (trombone), Callum Allardice (guitar, compositions), Daniel Millward (piano, keys), Nick Tipping (bass), Shaun Anderson (drums). Where: The CJC (Creative Jazz Club) Britomart 1885 Auckland 1st April 2015 and The Tauranga Jazz Festival Easter Weekend 2015. 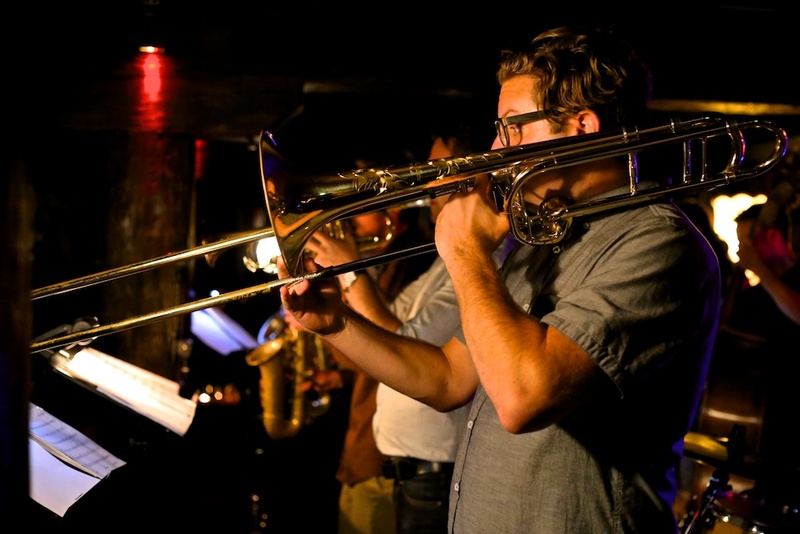 The trumpet is arguably the first instrument of Jazz but we hear it infrequently in Auckland. When we do it is seldom the lead instrument. To redress the balance, the CJC (Creative Jazz Club) featured Lex French last week, an impressive musician who is garnering increasing attention on the Jazz scene. This gig was one to look forward to. The occasion was the launch of his new Rattle album ‘The Cut’, which is an international affair; recorded at McGill University’s MMR & Studio ‘A’ utilising top rated young Montreal musicians. The mixing and mastering done in Auckland by Rattles Steve Garden. For the album release tour French had assembled a quintet of Wellington based musicians, people he has played with before and all well-respected. While French has been around for some time and amassed an impressive CV he is not as well-known in Auckland. After this album (and gig) that should change. In spite of his relative youth he has already worked extensively overseas and has long been an essential component of the Wellington scene. He came to my attention earlier this year when ‘The JAC’ toured New Zealand and he really stood out, as trumpet players of his calibre are few and far between in New Zealand. His ability to engage an audience goes way beyond mere chops as the way he connects is personal. His tone is impressive as is his control of dynamics. While a strong decisive player, he can also whisper a beguiling phrase. ‘The Cut’ features his own compositions and these are as strong as the playing on the album. If I had to pinpoint a particular mood, a particular composition I would draw your attention to ‘Metro’. Montreal has an impressive metro, teaming with cosmopolitan life. This track (2) and the others on the album connected me back to a city I love; a great Jazz city. This is what Jazz does best, paints sound pictures, reconnects us to fading memories while at the same time pointing to the unknown. ‘The Cut’ has an up to the moment feel with strong edgy interplay between instruments. Strangely it conveyed to me the vibe of Miles ‘Sorcerer’ album. Perhaps it was the compositions, perhaps it was the phrasing and intonation of the trumpet, but whatever the reason it evoked memories. Over the week I have played the album over and over and with each acquaintance a new pleasure discovered. French is from Wellington New Zealand and there he obtained a B Mus with honours before moving to Montreal’s McGill University to complete a Masters. McGill has a highly respected Jazz Studies course (the Schulich School of Music). As an aside, New Zealand has another respected McGill alumni in drummer Ron Samsom (now head of Auckland University’s Jazz Studies Program). The musicians on ‘The Cut’ are all from McGill, Montreal. They are Lex French (trumpet), David Bellemare (tenor saxophone), Nicolas Ferron (guitar), Nicolas Bedard (bass) and Mark Nelson (drums). French is clearly the leader, giving a consistently strong performance, but with impressive sounding musicians like this behind him he is extremely well supported. For the New Zealand tour he had Jake Baxendale (alto saxophone), Dan Hayles (Rhodes, Piano), Scott Maynard (bass) and Lauren Ellis (drums). Having keys replace guitar changed the feel somewhat, but both configurations were effective in their way. With the authoritative French upfront it could hardly be otherwise. French is impressive in an ensemble but he is a standout when leading his own unit. Buy this CD to show your support for an up and coming artist, but above all buy it for the pure enjoyment of sampling the best of contemporary Jazz. We can also chalk this up as another win for Rattle, in what is already an impressive 2014 Jazz catalogue. There are a number of factors that make music special to a listener and for most it is the familiar that attracts them. Improvised music is a different beast and the most valued quality is what Jazz essayist Whitney Balliet termed “the sound of surprise”. When Jazz listeners are fully engaged it is seldom the melody line or a familiar riff that holds their attention. While melody, chord voicings or an ostinato groove bring us to the moment, it is the promise of the new that creates a state of joyous anticipation. So it was with the ‘Antipodean 6tet’ and the rewards were immediately evident. Mike Nock told me recently that some of the young Australian bands are on a par with the best of what’s on offer in America. A statement like that from a person of Mike’s undisputed authority causes you to take notice. Some of the members of this group were among those mentioned by him. The idea for the ‘Antipodean 6tet’ was conceived in Berlin when Jake Baxendale, Aiden Lowe and Luke Sweeting decided to create a vehicle for their music. By the time of the Australasian tour they had added Ken Allars, James Haezelwood Dale and Callum Allardice. Those of us who pay close attention to Australian and New Zealand Jazz knew that we were in for something out of the ordinary. A heightened sense of anticipation followed the tour announcement. Earlier this year Rattle records released JAC’s ‘NERVE’ album. The album featured Wellington musicians Jake Baxendale (alto, compositions) and Callum Allardice (guitar, compositions). Many saw Jake as he toured with JAC during the launch tour and enjoyed his alto playing. Callum Allardice was in Germany at the time of the launch, but his compositions and arrangements were also appreciated. These two musicians form the New Zealand contingent of ‘The Antipodean 6tet’. Luke Sweeting is an Australian pianist who conveys more with his light touch than many do by playing percussively. His playing is thoughtful, airy and interesting. He has previously composed for sextets and is obviously central to the bands well crafted ensemble sound. Sweeting, Aiden Lowe (drums), James Heazelwood Dale (bass) and Ken Allars (trumpet) are well established on the Australian scene with the former two having toured Europe extensively. They have all attracted positive attention around Australia. All have worked as leaders, but melded into an ensemble the instruments speak in a unified authoritative voice. A Sydney bass player contacted me a few weeks ago saying that I would be mad to miss this innovative band. He was right in his estimation of their impact, as they appear to bring something fresh and exciting to the scene. A northern European aesthetic with an authentic Australasian feel. To best illustrate the above I must focus on Ken Allars. I have been aware of Allars for some years but it was probably his compelling trumpet work on Mike Nock’s critically acclaimed 2011 album, ‘Here and Know’ that first grabbed my attention. I received a review copy shortly after the 2011 release and was immediately struck by his use of dynamics and strong improvisational abilities. Later I saw him in the horn-line of the JMO (Jazzgroove Mothership Orchestra) when it toured Auckland with Darcey James Argue. Now seeing him with ‘The Antipodean 6tet’ my positive first impression is reconfirmed. On the opening number we saw his use of extended technique. Not so much the usual growls or smears, but a skilful deployment of flutter tonguing and airstream effects. The whistles, breathy explorations and pops augmented the contributions of Jake Baxendale who wove in quiet upper register ostinato responses (like Evan Parker in the opening few bars of ‘The Lady and the Sea’ – Kenny Wheeler). So controlled was the sound production that at times Allars sounded like he was playing a flute. When he did blast out a phrase it was doubly effective as it contrasted with the softer moments. I have seen bands who lower the volume for a ballad or a thoughtful meditative piece, but never quite like this. They skilfully utilised the pianissimo and piano and diminuendo to impart an infinite array of subtleties and within that space communicated a world of information. Earlier I mentioned the European aesthetic and perhaps I refer more specifically to the Norwegian ECM sound. I detected a strong influence of this future-facing aspect of modern Jazz in Allars playing. Later I asked him whether he had listened much to the modern Norwegian trumpeters. Yes he had checked them out in person. We then discussed people like Arve Hendriksen, Nils Petter Molvaer, Mathias Eick and others. While Molvaer and Eick often use electronics and loops there were no such effects used by Allars. This band is purely acoustic and the impressive range of sounds and effects at their disposal will have pedal manufacturers smiting their brows in frustration. Because of the sound balance, the imaginative drum work and the punchy bass lines are as strong in the mix as the other instruments. They are due to record shortly and I look forward to that. I urge anyone who can to catch this tour or subsequent outings. I guarantee that you will not regret it. What: ‘The Antipodean Sextet’ Luke Sweeting (piano), Jake Baxendale (alto saxophone), Ken Allars (trumpet), James Heazelwood Dale (bass), Aiden Lowe (drums), – in New Zealand – Callum Allardice (guitar).